It’s that time of year again when we buy plants that die a few weeks later in a late frost. Next month we buy the plants that will grow. Hopefully that won’t be the case now that we can put them in the wee poly greenhouse to harden off. We’ve got a new garden centre in the town. It used to be Dobbies, then Dobbies was taken over by the mighty Tesco and that started a downward trend. They still traded under the Dobbies name, but only the larger outlets flourished, if you excuse the pun. The little centres were just left to rot. That was certainly the case for Cumbersheugh Dobbies. It got so bad that it was better to buy your plants in B&Q or Homebase. Nothing looked as if it was being cared for, neither the plants nor the buildings. Eventually I stopped going and by the look of the car park, so did most people. Now it’s been taken off Tesco’s hands by Calders, who started up in Kirkintilloch and have made a good go of things so far. I visited the new Calders yesterday to get the Rhubarb and the Calabrese. Today we went back to get compost and also picked up a little golden leafed plant who’s name escapes me at the moment. It’s a little bit of winter colour. We were both impressed with the change, and the car park was full, but it’s early days yet. Did a bit of digging for Scamp’s new regime in the garden. Simple stuff like spreading old compost over some of the beds and getting tubs ready for new arrivals. Some pruning noted as needing done. If we get a few warm, dry days next week we’ll get some more things done. Scamp fancied a recipe for Chicken Curry that used the slow cooker to do the hard work and I’m all for that. It tasted really good, but we both agreed that there was too much liquid in the sauce, so we’re intending to have another go on Sunday. I like the idea that you stick everything in the slow cooker and leave it to get on with it for four hours. 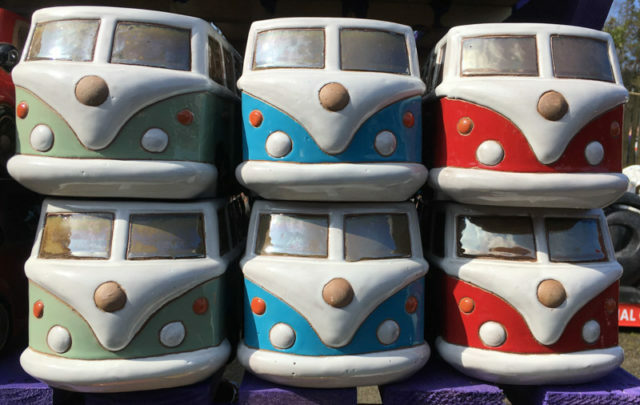 PoD is a set of camper van planters seen at the aforementioned garden centre. Very tempting, but nowhere to show them off. Tomorrow we may go in to Glasgow on the bus.